Many years ago, when we were young and foolish, we backpacked in Central America, exploring many countries and cultures, but not going to Costa Rica. The conventional wisdom among backpackers at the time was that Costa Rica was too much like the US, and was not worth exploring. After 3 months traveling throughout Central America we thought that a bit of familiarity would be nice, so off to Costa Rica we headed. Our first night in San Juan we found a Pizza Hut. We were so happy! Just enough of a taste to satisfy some of the longing for familiarity. We enjoyed our stay in Costa Rica and over the years have reminisced fondly on it. Fast forward to 2010. Now a bit older, and arguably less foolish, we began to think about life beyond Florence, Oregon and the working world. We started to toy with ideas of retiring someplace outside of the United States. "What about Costa Rica?" we said to ourselves. 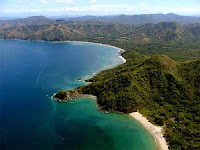 "hmm... it is certainly worth checking out", so we packed up our bags and headed to Costa Rica for Christmas break. Check out our baby blog on that trip here. First impressions were that it was a noisy place, full of diesel smells and bars on most of the windows to prevent theft. Commercialism was much more rampant throughout the country than when we were there 25 years ago. While there were many beautiful spots in Costa Rica we felt sure that it was not a place we wanted to be permanently, So- if Costa Rica is not where we want to be permanently- where WOULD we want to be permanently? Or maybe the better question was, is there ANY place we want to be permanently yet, because the search was so clearly incomplete? That is a more difficult question to answer. We love to explore, to experience new places, people and cultures. Where could we go? As we were pondering this question one evening we looked over a cliff to the ocean and saw a sailboat anchored in a beautiful bay. A light went off in our brains. How about a sailboat? We could travel to new places, and bring our bed with us. The planning and traveling to a spot, especially with a flexible schedule, with the ability to change plans at will, has always been our most satisfying kind of travel. .
We had both had some experience on sailboats and sailboards, but they were considerably smaller than the size of a boat that we could comfortably live on. We made the decision to sign up for sailing school the summer of 2011 to see what it was like being on a bigger boat. Every step we have taken along the way has convinced us that this is the right path for us. Sailing school, chartering in the BVI (check it out here), ultimately buying a boat and spending time on her in chunks as we could. Spelled backwards it is the same thing. A common name for an uncommon man. I am very lucky to have a partner who wants to explore as much as I do. Bob has been a building contractor, house builder, designer, artist, jack-of-all-trades. He has the ability to fix many problems that arise on the boat, and the willingness to learn the things that he can’t yet fix. He will be using me to do more of the bendy, small opening jobs to protect his back, but I am more than willing to take on that role. I appreciate his strength, both physically and mentally. It is important to know that someone has your best interests at heart. I am also appreciative of his willingness to support the varied projects that I take on. I am looking forward to sharing this new phase of our lives. There is no one I would rather sail off into the sunset with. Sarah has always been ready for an adventure. When I met her she had recently been running Appalachian river rapids by hard shell kayak, then she told stories of skydiving for a while the year before, and soon she was leading a 2 week canoe trip in Canada. She was 20. She also loves to learn. She's been a teacher, musician, artist, triathlete, but always a compulsive learner. Our progression from lubbers to cruisers benefits a good deal from her appetite for information. She welcomes new places and new faces, and reminds me that the journey is the gift. Sarah is so comfortable and fluid in the water that I tease she is part fish. She can swim a mile out and another back with enough ease to frustrate those of us who flail and gasp. She has a great reserve of patience, a willingness of spirit, and no puzzle book will go unsolved. We share our yearning for good walks, great hikes, amazing snorkels, awesome dives and sailing to the next harbor. The list can never be too long, we welcome all aboard. They say that guests can pick the time, or pick the place, just not both! It was a pleasure meeting you, Jisel. I hope you will follow us on our journey!